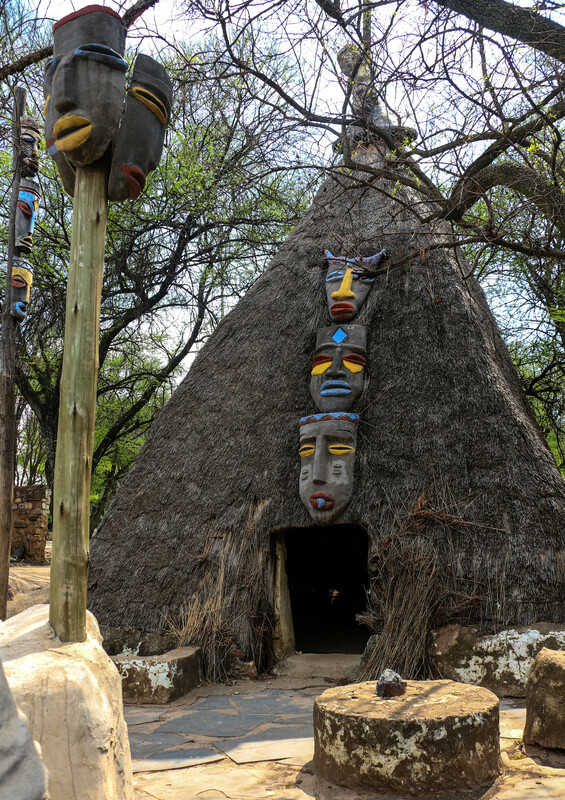 The Credo Mutwa Cultural Village is a site of importance for African beliefs, spiritualities and traditions. Rich in African aesthetics, it is tucked away in the middle of Soweto, in Jabavu, in stark contrast with the eventful, urban and modernised township lifestyle. The sound of crickets and chirping birds, and the swaying of tree branches in the gentle breeze is magnified in the tranquil and serene setting of the Credo Mutwa Cultural Village. 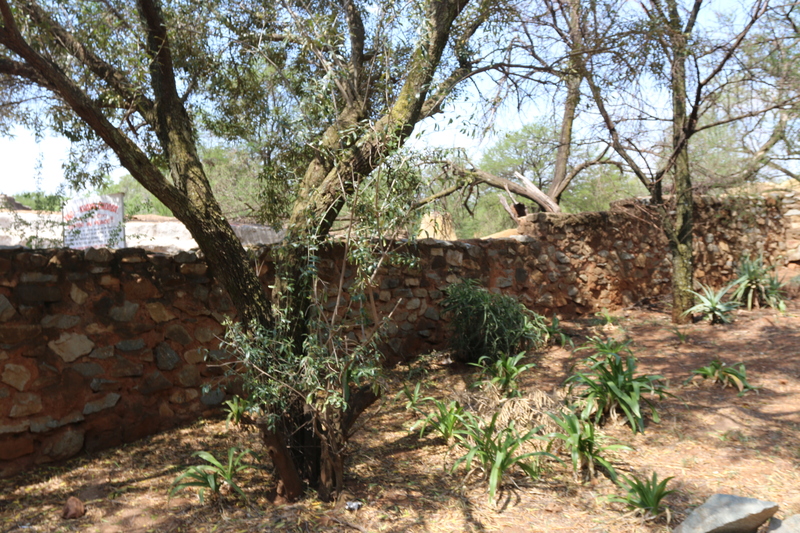 Secluded in the woods of the Oppenheimer Gardens historic park, the village seems to be a world away from Soweto, which is only steps away. The sculptures, so robustly representative of the heritage of the Zulu, Sotho, Ndebele and Arab people among others, are all supersized. 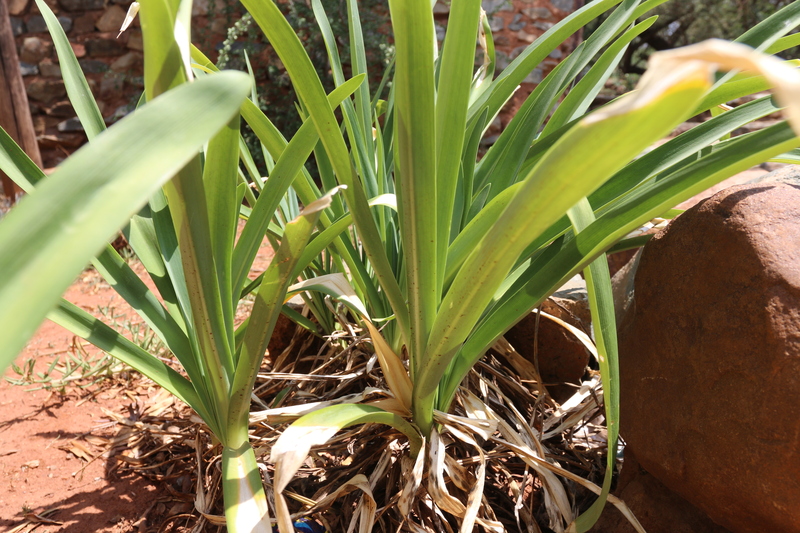 The village is also a holy grail for traditional healers because of its greenery consisting of indigenous plants which are used for healing and other traditional purposes. “ALL LIARS, FOOLS, SKEPTICS AND ATHEISTS MUST PLEASE KEEP OUT!” These are the words on the village entrance’s welcome board, undoubtedly capturing the attention of many visitors. The signage, in black and red bold hand lettering, further cautions that a curse lasting seven years may be cast upon any visitors who destroy any part of the place. “There are a lot of people who are skeptical of the village,” says the well-spoken man who spends most of his days at the village. The 35-year-old says he was only six when he paid his first visit to the village, and, since then, it has been a place of solace where he also undertakes some of his spiritual and traditional rituals. “My name is Mojalefa Njase”, he says, and, adding in emphasis, “wa ha Mofokeng (a child to the Mofokengs).” Njase is his mother’s surname, while Mofokeng is his father’s. He says that according to the BaSotho people, if your parents were never married, you use both your parents’ surnames to symbolise that, ultimately, you are an heir to your father’s family. Njase wa ha Mofokeng says the sculptures’ eerie and strange qualities create unease in some visitors. Not surprisingly, since some are triple headed and others have skulls on strange parts of the body. “Ntate Mutwa (Mr Mutwa) did not create the sculptures to be worshiped, but some people twist it and think that the people who are living here are worshiping the sculptures, because we refer to them as Modimo mme, Modimo ntate, Modimo morwa and Modimo moya o halalelang (God the mother, God the father, God the son and God the holy spirit). The truth about them is that he wanted us to keep our heritage so that we could pass it on and remind ourselves constantly that this is where we come from,” Njase wa ha Mofokeng says. Siza Mpye (48) a Christian woman and first time visitor, was not moved by the caution at the entrance warning about the curse. “I am not superstitious,” she shrugged. 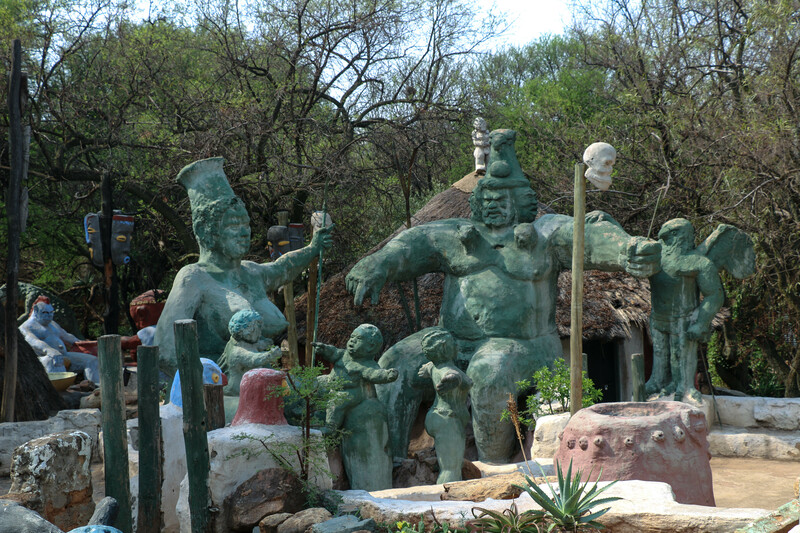 In 1974, traditional healer, author and artist, Credo Vusamazulu Mutwa, was given a piece of land with which he created the cultural village, erecting sculptures and homesteads of different African tribes to demonstrate and teach people how different tribes in Africa lived. The Village was built for the purposes of preserving traditional beliefs of African people in a society that was fast developing towards western beliefs. During a time of political unrest in the apartheid era, Mutwa is said to have been misquoted by an Afrikaans publication, and this led to student protesters burning the village down. According to the current village dwellers, he was misquoted as having said that the apartheid government should send armies to attack students rioting at the time. Njase wa ha Mofokeng, who describes himself as a “cosmopolitan man”, says he received his calling three years ago and has still not accepted it, citing the difficulties that come with practising as a young traditional healer. “As an individual that grew in this cosmopolitan life, it’s not something that one would like to follow and just leave your life behind,” he says. Mutwa’s renouncement of Christianity in favour of African beliefs was met with a lot of controversy and many believed that he dabbled in witchcraft because of his boldness and unapologetic stance on African beliefs and traditions. He is said to have predicted the September 11, 2001 Twin Towers catastrophe by way of a painting that hangs in the village’s Green Room that is signed “1979”, long before the crash. Another claim that has been met with a lot of controversy is that he predicted the HIV/Aids pandemic, and that this is represented in his village in sculpture form. The sculptures and other traditional and cultural paraphernalia are layered with dust because of renovations under way. Some structures, such as the KwaDukuza Village which is representative of Zulu people’s huts, have been newly thatched. Before 2008, the entire village had been under maintained resulting in it being crime infested and a danger to surrounding locals. 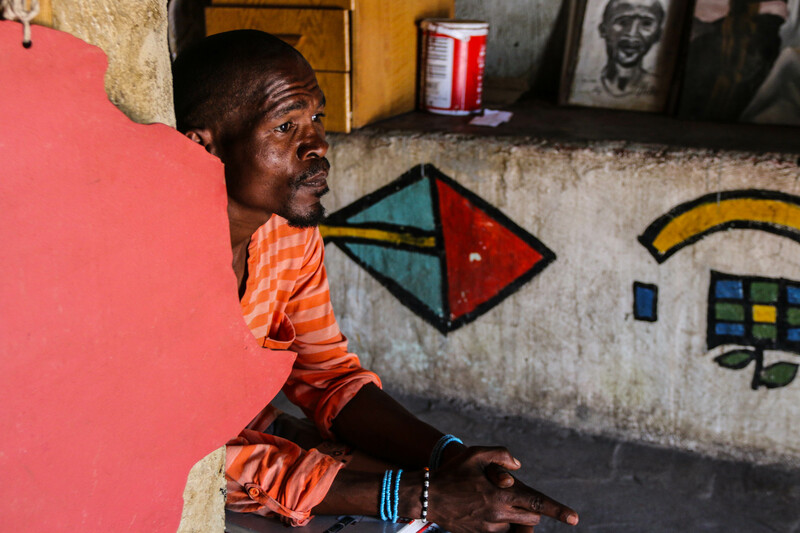 Lebo Sello (42), a prophet and the site manager of the cultural village, who speaks of Credo Mutwa and the village with the greatest admiration, has been using the village as his sacred sanctuary for almost 10 years. Sello started making the village his home in 2008 when it was being misused and abused by locals. In him was a desperate need to restore the legacy of Madala (sir) Credo, as he fondly calls him, and much like Mutwa, to continue spreading teachings about African ways of living, especially for the people of Soweto. SAVING GRACE: Site manager Lebo Sello keeps bad elements out of the village. “Noma yini bhoza yami, woza (Anything my boss, come),” he says in mimicry of the troublesome young men addicted to nyaope that he constantly has to keep out the site. Sello seemingly possesses a sixth sense that is able to notice even the slightest of movements in the village. He looks over my shoulder and with a squint of the eye, looking into the distance, he spots a pedestrian coming from the end of the village attempting to use it as a shortcut to his journey. “Hey, kgotlela moo otswang teng! (Hey, go back where you came from!) That is not the entrance,” he shouts. Sello says they have to deal with such challenges daily. “I had to fight first by cleaning out the drug users and the gents who chilled here. I started fighting those that turned this place into a brothel. Even though it’s still happening, it’s happening on a very small scale,” he says, gesticulating with index finger and thumb in front of his face. “So, public indecency, those are the challenges we still have,” a weary Sello says. Makhosi Jabulani Sibanyoni (52), a traditional healer who has been practicing for 34 years, uses the village not only for his personal spiritual betterment but as a graduation space for his trainees and as a place of teaching for his sangoma initiates as well. He is the founder of the South African Traditional Medicines Training programme and a member of the Gauteng Traditional and Faith Medical Practitioners. Setshedi Molefe (62), a pensioner and a local community member living close to the village says, “They must restore the cultural village, because it seems as though it’s falling apart. It needs renovations, because the owner created it with love. He wanted to show people here in the township what culture is. “As people who live in the township we don’t care about culture, that’s the problem,” says Molefe as he speaks about the state of the village and its lack of maintenance. “It will be better when they restore it because these [Soweto] children speak English too much, they don’t know their heritage,” he says in a tone suggesting annoyance. SPIRITUALLY GROUNDED: Makhosi Jabulani Sibanyoni in the Green Room, also called the Mother Nature Room. Although the process of cleaning out the wrongdoing started in 2008, renovations to the village started early in 2017 and were expected to finish in December. The village’s restoration is administered using funds from donations made mostly by visiting tourists. The heritage site, as declared by Joburg City, is more than just an attraction for the amusement of tourists. 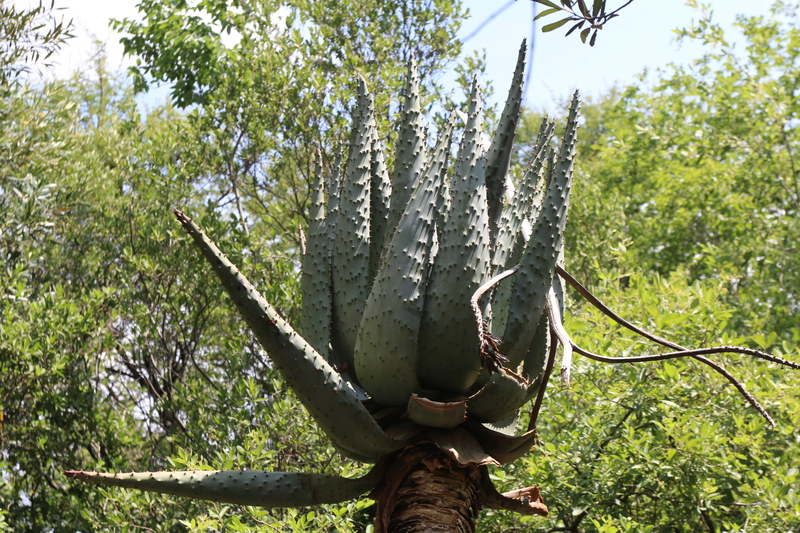 The village has a constant bustle of traditional healers looking to pick traditional plants for their medicinal practices as well as Soweto residents needing to find a noiseless space to connect with their ancestors. The village has been used by the locals to perform cleansing rituals away from their busy lives at home. Sibanyoni describes his divine discovery of the village saying a dream led him to it in 1989. “I dreamt of this place and then I came just for a visit and I saw the village and started frequenting it. Ngize ngizo phahla (I’d come to appease my ancestors) and connect with the spirits. 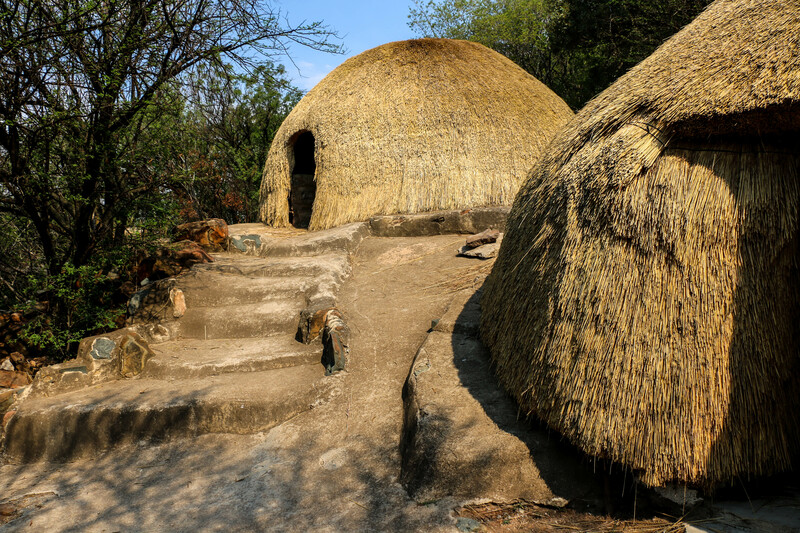 ZULU HUTS: The newly thatched huts of KwaDukuza Village, representing the Zulu people. Then I stopped coming here for quite a long time until 2014. What brought me back here was wanting something that could connect amathwasa (sangoma initiates). We needed a place that would take us back to tradition,” adds Sibanyoni. 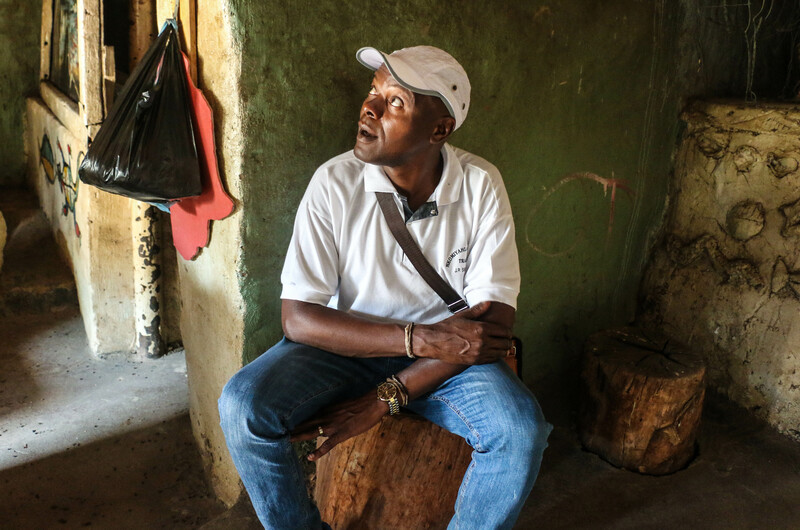 Contrasting the current state of the village to how it was before it became rundown, Sibanyoni says, “It was still very tidy, very neat, very very sacred. When you came here as a lady you wouldn’t come here dressed in trousers and without a head wrap. A guy wouldn’t come here in shorts. Your appearance would be respectful. That was a basic law of this place and you would connect with your ancestors, from the village’s entry point, you’d feel a sense of connection,” he says proudly. Njase wa ha Mofokeng says his mother was a traditional healer who used to frequent the village for her own spiritual practices. The village to him, extends to more than just a sacred space for centering his spirit and mind, it is an important part of his relationship with his mother. Here, as a young man, he watched very closely her practices. “My mum was a traditional healer. The mother to my mum was a traditional healer. I knew that they came here and did some rituals,” he says as he reminisces about her. “When I had my down times and my high times, I spent time here. To revive my soul and spirit. One of the reasons that made me love and be interested in this place was my mum. Mme waka natla mo a dula a tlo pahla a tlo batla moreana (My mum used to come here to appease her ancestors and to look for medicine). The whole Credo Mutwa Village has indigenous plants,” Njase wa ha Mofokeng says. Despite the lengthy process of the renovations, this village continues to be a significant part of the lives of the likes of Sello, Njase wa ha Mofokeng and Makhosi Sibanyoni who come from different walks of life in the excessively busy Soweto township. Since Sello’s attempts at the village’s restoration, the village welcomes members from the Soweto community to join in on the Shamanic drumming sessions held each Friday as well as the celebration of annual rituals welcoming the four different African seasons. “This place helps me to connect with my inner being, that’s why it’s so very important to me. My favourite teaching is when they speak about the importance of a woman in this world. It brings me back to who I am and where I come from,” Sello says. Sello truly is the hope of the village. If he had the chance to have the world in one place at the same time, he’d tell them, “Idlozi likhona, liyaphila (Ancestors are real), they are not demons,” he says. Intelezi or skanama is used for cleansing three months after the death of a family member. This aloe variant is used to flush out toxins in the blood. 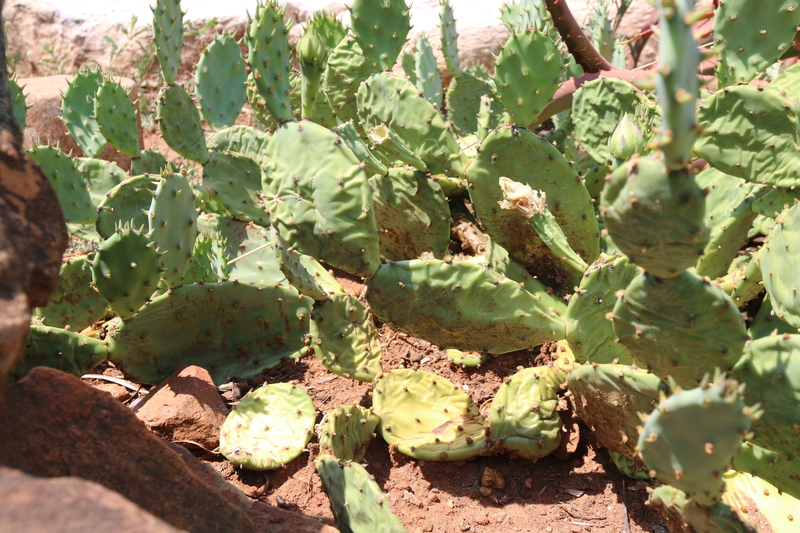 The succulent is used for the healing of the ear. Extracts of the olive tree are used to treat eye problems.